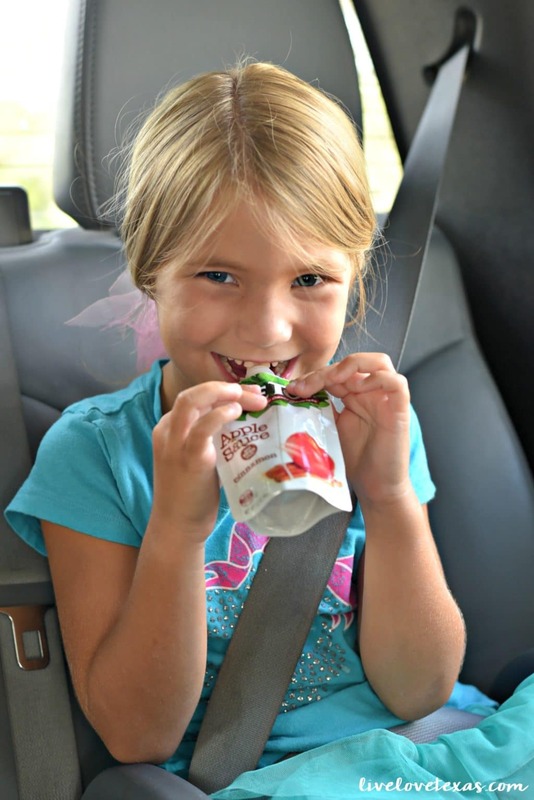 This post on 5 Road Trip Must Haves with Kids is sponsored by BabbleBoxx.com on behalf of Tree Top. We are a road tripping family. Not afraid to drive and more likely to hop in the car than a plane any time of year. But summer time is when we really hit our groove and 70% of our road trips take place. Over the years, we’ve really come what the road trip must haves with kids are. In case you haven’t heard, Texas is a big state. 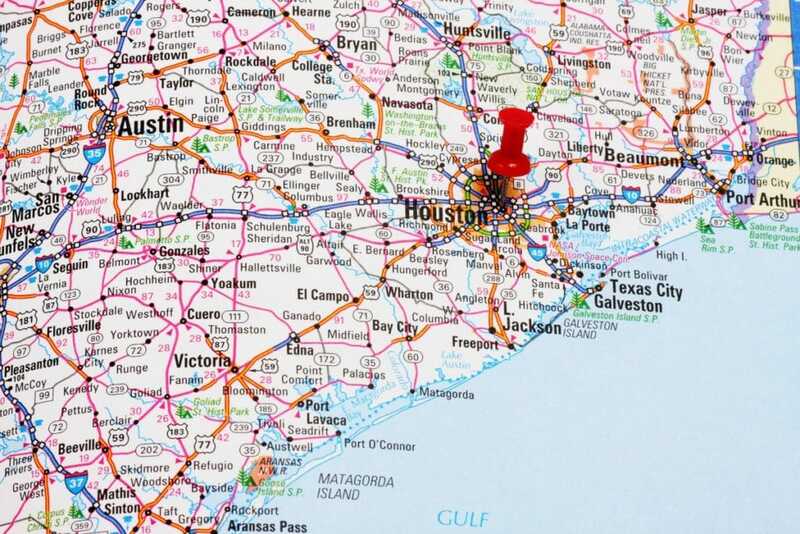 If you’ve ever driven across I-10 and it’s taken you an entire day to get through just this one state, then you have a better idea than most. But to truly understand it, I think you have to live here. We live in Austin which is considered Central Texas, but let me tell you while it may technically be near the center of the map, getting out of here is no joke. We spend more time just getting out of Texas than we do on any other trip. When we visit Florida for our big beach trip in June, we spend at least 5 hours just getting out of the state. It seems like forever, since the remaining 8 hours is broken up by passing through four other states. I don’t know about you, but for us, hitting all of those state lines makes us feel like we’re making more progress. While our big trip of the summer (the one that takes us out of Texas) is over, that doesn’t mean that our road trips have ended. Even visiting other major cities with the state takes hours. Our “quick trips” are the ones to San Antonio where it’s only 2 hours each way and we’re able to turn into day trips to visit the grandparents or go to Sea World. But that’s as close as quick as we can get to the big cities. A visit to Dallas? 3-4 hours. Houston? 3 hours. Sure you can (and we have) made day trips to these places, but it’s exhausting. You really have to plan out your visits to take advantage of your time on road trips in Texas. 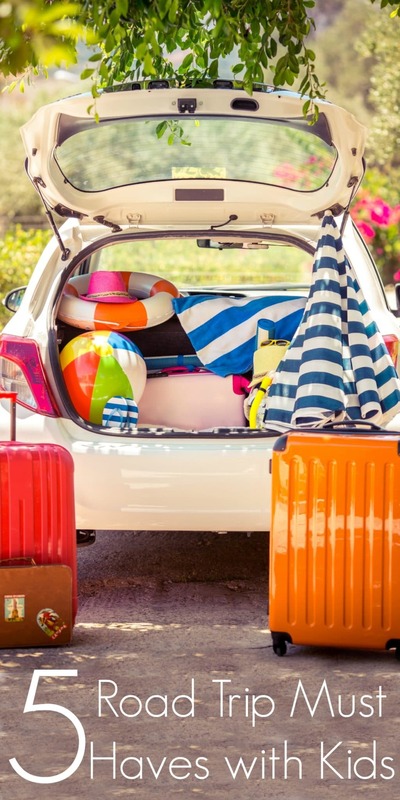 From all of that time we spend in the car, both locally and across the country we’ve come up with some ways to make road trips go more smoothly and the road trip must haves with kids that are essential to survival. 1. Snacks. I don’t know about your kids but my kids start asking for snacks before our car even leaves the driveway. There’s something about the adventure being in the car whether it’s a trip to the neighborhood pool or a road trip that really fires up their appetites. Immediately. Having lots of healthy snacks packed and ready to go is one key to keeping kids happy on a road trip. I like bringing along portable snacks like crackers, granola bars, and applesauce. Crackers pull double duty because they can also be used to calm queasy tummies from motion sickness. 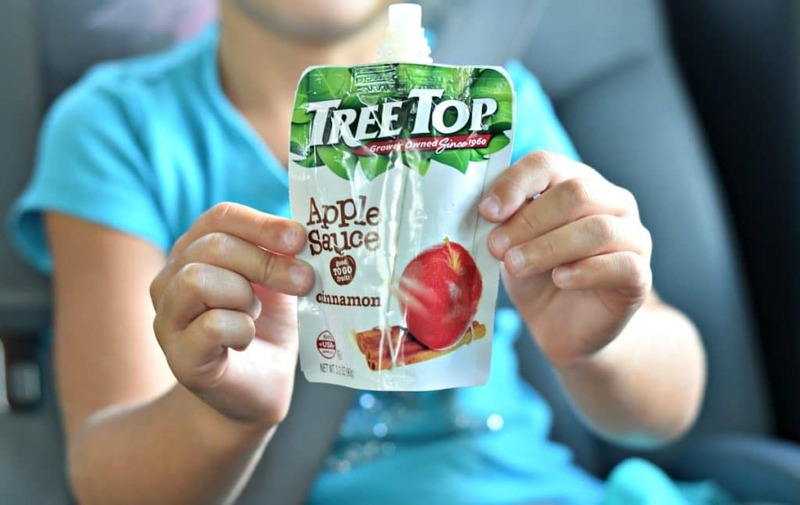 For applesauce, Tree Top Apple Sauce Pouches are the perfect snacking solution because these no spill squeeze pouches are great for kids because they don’t make a mess, can go anywhere, and are pure fruit with nothing artificial like high fructose corn syrup. And now, Tree Top Apple Sauce Pouches is available in Texas! These packable snacks come in a ton of great tasting fruit flavors and are made with 100% USA apples from growers’ local orchards in the heart of Washington’s apple country. 2. Drinks. A word to the wise on this one, have drinks available but limit them as best as you can. Especially if you have a child like Colby who would do nothing but drink if she had her way. Because drinking obviously leads to more potty breaks. I always have at least one water bottle per child, but also bring along some flavored drink pouches to mix things up. 3. Portable potty. If you’re currently or have recently potty trained, having a portable potty in the back of your car will save you time and sanity. You won’t have to worry about where to go and dragging your hoping your child makes it to the restroom, you’re prepared and can get back on the road in no time. Don’t forget the wipes! 4. First Aid Kit. As any parent knows, kids get sick or don’t feel well at the most inconvenient times. You don’t want to be stuck with a child that isn’t feeling well on a deserted Texas farm road with no services in sight. Don’t forget to add children’s acetaminophen, ibuprofen, anti-nausea tables, pink allergy medication, and a thermometer to the standard kit. 5. Entertainment. 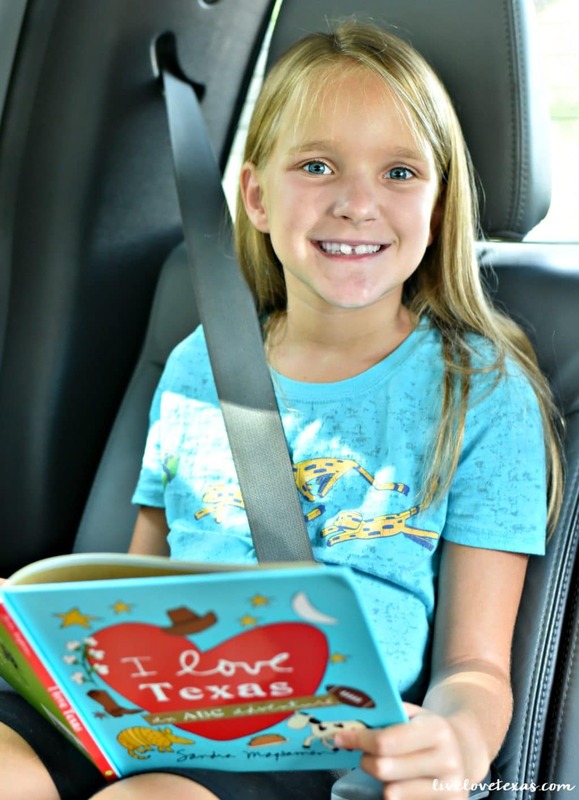 Stash books, crayons, and coloring books in the seat pocket to keep kids busy on car rides. I like to keep a small stash of items in a closet that are only used for road trips so the girls will be excited and more entertained by these rarely seen items. When the novelty of other activities have worn off and the kids are driving you crazy asking, “Are we there yet?”, for the 800th time, is when we finally break out the electronic devices. Limiting screen time in the car ensures the batteries will still be charged if you need to use the device for things like waiting in line for dinner. 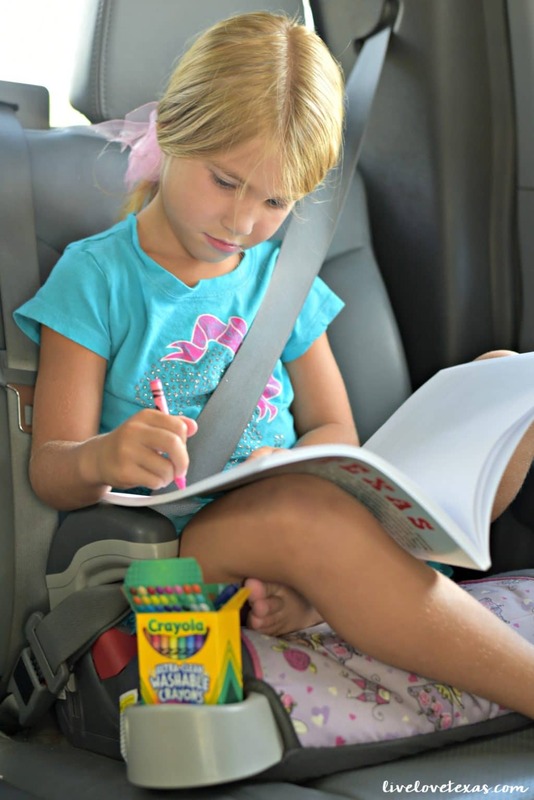 For all of my fellow road warriors, what are your road trip must haves with kids?